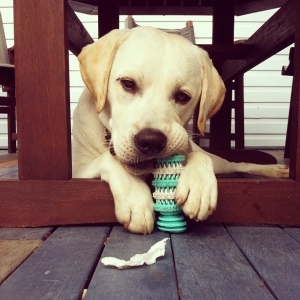 Toys are crucial for any active, playful dog. Not only do they provide entertainment when you’re not in the mood to play yourself, the right ones can be stimulating and challenging for hours, which means we get a break! Below, we’ve rounded up our top four favorites – ones we know pups love time and time again. First, a note about safety: when buying toys for your furry friend, keep in mind that you want ones that aren’t too small or easily swallowed. Remember, when dogs play with their toys, they’re practicing their prey instinct, and will often try to rip, tear, and pull them apart. The sturdier, the better! The Kong toy is beloved among pet owners for being durable, long lasting, and versatile. Our favorite use for a Kong is as a treat: stuff it with peanut butter, pop it in the freezer to harden, and give it to Fido before a trip or as you step out of the house. The challenge of licking the hardened peanut butter out of the Kong will keep him stimulated, and if your dog is like every dog we know, he’ll lick every bit of peanut butter until there’s none left! Stuffing-free toys. Hand a dog a stuffed animal, and he’ll likely shake and chew it until it tears. The aftermath, as you may know, is stuffing all over the living room floor. The solution? Try out a stuffing-free toy. They don’t result in a mess, and they offer the same soft, floppy satisfaction. If you pick one with a squeaker at the center, your dog will love it even more. Just make sure to keep an eye on the toy for any rips or tears, as your pup may accidentally (or purposefully) get to the squeaker and chew or swallow it. Strong rope toys. Dogs like toys that are interactive — rope toys that have lots of twists and turns keep your dog engaged. Look for ones shaped like a bone or knotted tightly, and they’ll last through the wear and tear. Bacon Flavored Chew Toy. What’s not to love? This bacon flavored wishbone is beloved among all dogs, and for reasons we think you understand. Long lasting, flavored, and top rated on Amazon (link) among pet owners who swear by the toy. What are your dog’s favorite toys? We’d love to hear in the comments below!